A prosthetic tooth that is anchored in the jawbone to replace a missing tooth. a plastic or metal anchor that is inserted into a jawbone to provide permanent support for a crown, fixed bridge, or denture when the bone itself would provide insufficient support. 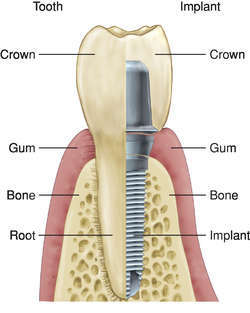 About 8 weeks after a tooth or teeth are removed, the anchor is screwed into a hole that has been drilled into the jaw. 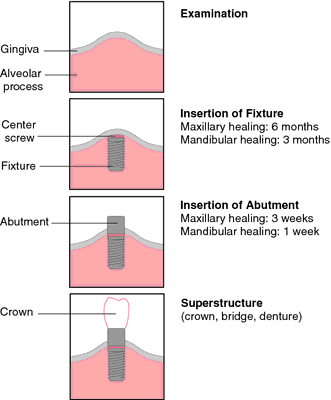 The gingiva is closed over the implant site, which allows the area to remain sterile, and new bone is allowed to grow around and fuse with the anchor for up to 6 months before the crown, bridge, or denture is attached. Also called a delayed load implant. Immediate load dental implants allow placement of a dental restoration or denture at the time of insertion of the dental implant. Osseointegrated implant Dentistry A prosthesis anchored in the maxilla or mandible, allowing subsequent placement of artificial teeth. See Cosmetic dentistry. 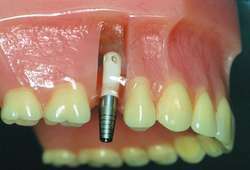 Ultrasonic devices should not be used on dental implants. AFTER a week's silence, President Christofias finally spoke about deputy Attorney General Akis Papasavvas' tooth implants at the weekend. WE ALMOST felt sorry for deputy Attorney General Akis Papasavvas on Thursday night when he appeared on RIK's main news show to announce that he would be returning the 17 grand that we paid for his tooth implants. The poor guy was visibly upset -- his voice was quivering, he was stuttering, words were not coming to him, he had the faraway look, he grit his tooth implants, he was playing with his pen and he kept moving about in his chair like a hyper-active kid. Montesquieu had written extensively about the tooth implants of the French aristocracy in his celebrated book De l'Esprit des Lois. For once the taxpayer had won, as Akis had bitten off more than he could chew, even with brand new tooth implants. From what has been said, applications for tooth implants had never before been approved by the health ministry and they would want to keep it this way. As was reported by Politis last week, Papasavvas had 10 tooth implants by a private cranio-facial surgeon and applied to the state for reimbursement of the e1/417,000 bill. It would be interesting for the health ministry to inform us how many other people have been given the go-ahead to have tooth implants privately, at the expense of the taxpayer? Whoever it was, the Health Minister Christos Patsalides is ultimately responsible, because under his watch his ministry is paying for tooth implants for a state official on a top salary, while low-income citizens in much greater need of financial help for private healthcare are ignored by the state. THE COMRADE'S bosom buddy, Deputy Attorney-general Akis Papasavvas was in the news again on Friday when Politis revealed that he had 10 tooth implants at a private cranio-facial surgeon and got the health ministry to reimburse him for the e1/417,000 bill. Pats should tell us for how many other public employees the taxpayer paid to have tooth implants at a private clinic, or is this a benefit offered only to the comrade's bosom buddies? The guy is on a salary in excess of 100 grand a year and could afford to pay for tooth implants if he did not want a state masella.